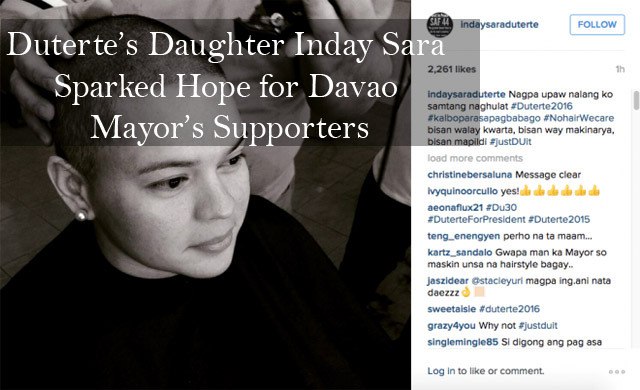 Former Davao City Mayor Sara Duterte-Carpio posted a photo of having her head shaved captioned in her own dialect saying that despite having no money, despite having no machinery, even if we lose.. The post was also accompanied with the hashtag Duterte 2016. Davao City Mayor Rodrigo Duterte had recently and once again declared that he will never run for the 2016 presidential elections due to lack of funds and his family would not let him especially his daughter Sara. It was last week when there had been speculation that the local politician will run, yet last Monday, the mayor had been firm that he will not run. Once again he said that he does not have enough funds and he respects his family’s request for him not to run. This made people go to Inday Sara’s Facebook and asked her to let her father run as a presidential bid and serve the country from the highest government office. As an answer Inday Sara said that a wise man and politician such as her father has his own decision. Then she had posted the photos of her head being shave saying that she is sending good vibes to her father dearly locally known as ‘Digong.’ Even Duterte’s assistant, Christopher “Bong” Go, posted a photo of himself having a haircut saying that he is getting ready in case his boss files for candidacy as he is also hoping for a miracle. Sara’s photos does not clearly say anything whether she had let her father run or not, but Duterte’s supporters are hoping that this is a good sign.